Canadian’s have a rough time getting TV streaming services online thanks to the many roadblocks between the U.S. and Canada. 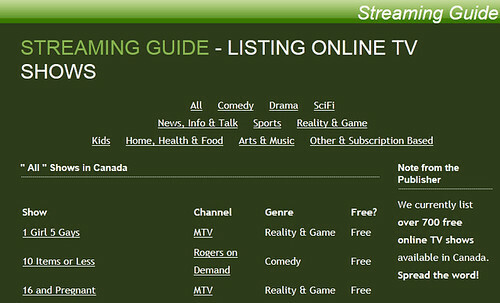 But I noticed a very nice and comprehensive guide to all online TV streaming resources available to Canadians thanks to a link on Daleisphere.com. Seppo Sahrakorpi of Pilvi Computing has compiled a very comprehensive ‘Streaming Guide’ providing an alphabetical listing (sortable by genre) of TV shows available for streaming in Canada. If you’re in Canada and don’t want to mess with Hotspot Shield to access Hulu, this is a great resource!